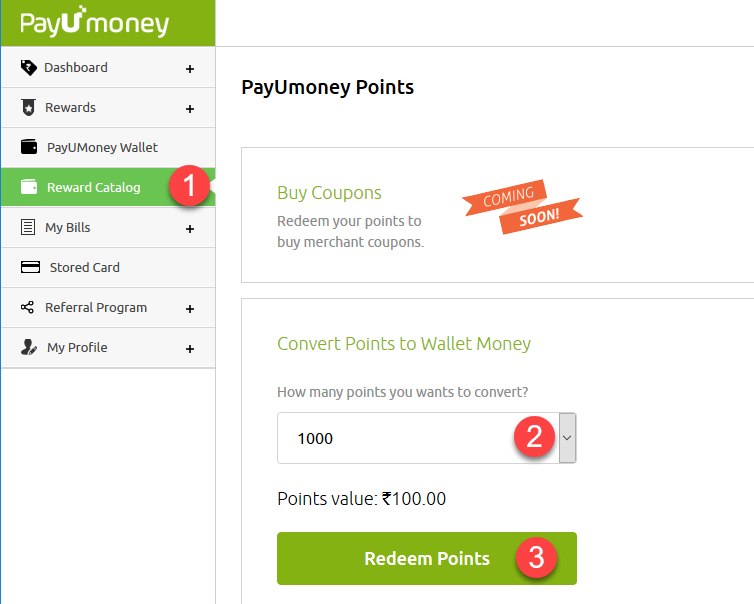 PayUmoney users earn 10% PayUmoney points on most of the successful payments. These points convert to rupees as Rs. 100 for 1000 PayUmoney Points. Calculating that further, users earn 1% cashback for payments made via PayUmoney. This is not a big amount, but certainly better than nothing. Hence, using PayUmoney wherever available is a good plan to save some money. Currently, earned points can only be converted to rupees as PayUwallet Money. The wallet money can be used in your next payment or else it can also be withdrawn to a bank account after paying applicable fees. You can convert points to wallet money in the multiples of 1000 points. So, you need to earn 1000 points before you can convert them to money. Every 1000 points earned can be converted to ₹100 of wallet money. Go to PayUmoney website and login to your account. If you also maintain a seller account, be sure to login to your buyer dashboard. From your buyer dashboard, choose Reward Catalog. Under Convert Points to Wallet Money, choose 1000 points. You can only convert a minimum and maximum of 1,000 points in a single transaction. Click on Redeem Points to finalize the conversion. After a successful conversion, your PayUmoney Wallet account will be credited with ₹100. You can access the wallet by clicking on PayUMoney Wallet in the left sidebar. You’ll be able to use the money from the wallet the next time you happen to make a purchase.